The first Tech Field Day presenter that we heard from was MetaGeek. I’ve been a fan of their free InSSIDer product for a while now. At the time, my needs were fairly simple when it came to wireless spectrum scanning. I simply looked for the SSID network names and used a little interpolation to help me find access points. However, the 2.4 GHz spectrum where most client devices now operate has become congested with devices and sources of non-WiFi interference, so little tricks aren’t going to cut it any longer. You need a serious tool to help you make sense of things. MetaGeek offers a solution to help you find out a little more about the space around you. The presentation started out with a quick recap about the founding of the company. Once nice thing that I saw was that the head geek and founder, Ryan Woodings, saw a need and capitalized on it. His original device was designed to scan wireless mice for interference. He expanded it to include more and more sources of wireless transmission. Much like any geek or nerd I know, he started peeling back the layers and diving deeper into the problem. A couple of fun pictures about the first MetaGeek offices and their exposure on Engadget leading to their success today had me feeling a little nostalgic. It’s always nice to see a company come from humble beginnings and enjoy great success. Once the short and fun history lesson was out of the way, it was time for the real payoff – a demonstration of the flagship Wi-Spy DBx analyzer tool and the associated Chanalyzer Pro analysis software. The Tech Field Day delegates also recieved a Wi-Spy and copy of Chanalyzer Pro so that we could follow along with the geeks as they laid out their program and it’s capabilities. 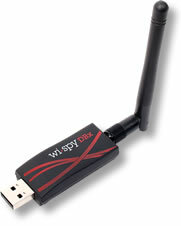 The Wi-Spy DBx is a very unassuming piece of hardware, a USB adapter with an RP-SMA connector on the end. The small form factor allows it to be plugged in just about anywhere quickly and easily. The DBx model allows you to scan both the 2.4 GHz spectrum where 802.11b and 802.11g networks operate and the 5 GHz spectrum where 802.11a networks are prevalent. Note that the Wi-Spy can’t scan both network simultaneously, so if you want to do captures on both at the same time you’ll need two DBx units, or one DBx and one 2.4GHz-only unit like the Wi-Spy 2.4x. There is also a patch antenna option that allows you to be a little more specific about the direction of the signal detection. The Chanalyzer Pro application is where you are going to spend most of your time. It gives you a great visual representation of the information the Wi-Spy will be passing along to you. The application packs a lot of information into a small space. The line graph at the top center shows you the utilization for the spectrum currently being scanned. There are options to turn on/off the average and peak utilization, as well as the intensity of signals in color. This is where you will notice the utilization of a given frequency or channel. The middle pane show the ‘waterfall’ view, which is the representation of the top pane over time. This gives you the opportunity to see any sources of interference as they appear and persist. The bottom pane gives you more specific detail to drill into, such as SSID overlay or duty cycle information. This is painted in both a specific graph on the bottom and in the case of the SSID, overlaid on the top graph to allow you to see that there are too many access points (APs) on the same channel in your vicinity. The large graph on the left side of the window extends the waterfall view over time, but also allows you to move the graph to any point during the time of the packet capture. This is a great feature for sources of interference that are transient. You can rewind and fast forward much like a DVR. This is great if you were preoccupied when the interference happened or you need to review it again to profile the specifics for later classification. During our great demo, Ryan and Trent Cutler were showing us some of the more interesting interference sources they have seen and classified. Much like any good investigator, they can recognize things like the difference between 802.11b and 802.11g APs on sight, as well as being able to tell you the difference between a microwave and a cordless phone. For those of us not as gifted in the art of interference profiling, the Chanalyzer application includes preset waveforms that allow you to overlay them on the graph to tell you the difference between your cordless phone and a wireless video camera. Very handy for nerds like me that need a little more time in the saddle before we can spot the trouble from the line graph itself. You can also take captures of interference sources and send them to Trent and he’ll help identify them if it’s something that hasn’t been seen before. He keeps a collection of the odd and interesting captures he’s gotten, like a fun version of a stamp collection. I think my favorite was the ceiling fan mounted audio system. The MetaGeeks really knocked it out of the park for the first batter up at the plate. They looked a little nervous at first, but once into their element, they really shined at showing the delegates what their tool was capable of doing. I was very impressed by the power of their software along with the ease of use. So much so that after I returned from Tech Field Day, I spent a whole evening running around my house with my Wi-Spy turning on microwaves and cordless phones and being amazed at what I saw. The other spectrum analyzers I’ve seen run in the thousands of dollars, which makes the Wi-Spy an incredible value for those wanting to jump into the spectrum analysis arena without needed to sacrifice a kidney in the process. I plan on giving the Wi-Spy a real run for it’s money in the near future to see how well I can integrate it into what I do every day. I even plan on getting some interesting spectrum captures to see if I can stump Ryan and Trent. 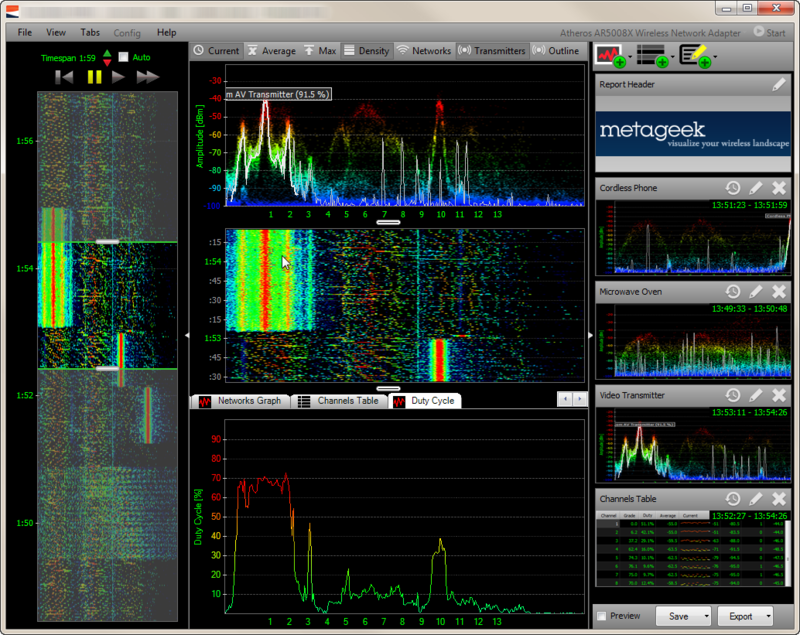 If you’d like to learn more about MetaGeek and their product lines, you can check them out at http://www.metageek.net. You can also follow them on twitter as @metageek. MetaGeek was a sponsor of Tech Field Day, and as such they were responsible for paying a portion of my travel costs and hotel expenses. In addition, they provided a package to the delegates containing a Wi-Spy DBx with Chanalyzer Pro as well as Chanalyzer Lab and a Device Finder patch antenna option. There was also a WiFi Interference Detection Kit (a bag of microwave popcorn) included in the black lunchbox that housed the rest of the equipment. This package was provided to the delegates for evaluation purposes and was in no way intended to curry favor. They did not ask for, nor were they promised any consideration in any review. Any and all opinions and conclusions in this review were provided freely and clearly and reflect my own thoughts on the product. This entry was posted in Tech Field Day, Troubleshooting, Wireless and tagged Tech Field Day, Wireless by networkingnerd. Bookmark the permalink.